Given the recent uptick in crime in Hill East, MPD Lieutenant James Dykes has moved the August PSA 108 meeting to Thursday, Aug. 6, 7 pm at Liberty Baptist Church (527 Kentucky Avenue SE). I encourage anyone who has questions or concerns about recent criminal activity and incidents in the neighborhood to attend the meeting. Lt. Dykes and his officers will provide the latest information and answer resident questions. 18th Street SE & Potomac Ave SE intersection looking north from Congressional Cemetery. The failure of vehicles to yield to pedestrians at both the 18th & Potomac and E & Potomac crosswalks, both of which lead to the main gate at Congressional Cemetery. 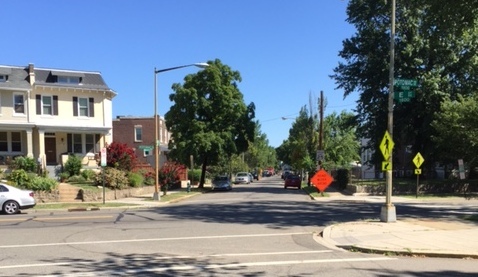 The problem is particularly pronounced during rush hour – a peak time for dog walkers at the cemetery and commuter traffic along Potomac Ave.
High rate of vehicle collisions due to Potomac Avenue’s transition from a two-way to one-way street at 18th Street SE. Drivers typically move over to the left lane prior to 18th Street, leading to collisions with drivers turning west on to Potomac Ave.
Request and install pedestrian pylon signs at both crosswalks. Improve signage at the intersection. Conduct a traffic study of the intersection. I’ve encouraged DDOT to review data gathered from the previous 17th & 19th Street Safety Improvement Study. Install “No Turn on Red” signs at the intersection of 17th Street and Potomac Ave SE. This would help tremendously with pedestrian safety at both the 17th & Potomac and the 18th & Potomac intersections. Drivers consistently fail to stop when turning on red. Implement traffic calming measures based on results of traffic study. Options may include adding raised crosswalks, installing a signal/flashing light and/or installing a roundabout. Conversion of 19th Street SE from one-way to two-way. Unfortunately, there was not a lot of discussion about this idea during the 17th & 19th Street Safety Improvement Project. The safety improvements that DDOT has already implemented along 19th Street are modest – repainted crosswalks, new signage and an electronic “your speed is” sign. Converting 19th Street to two-way would reduce traffic speed and volume along the corridor and improve access to the new Hill East/Reservation 13 development from the north. Both of the long-term solutions would need significant support from the neighborhood. I plan to work with my ANC 6B colleagues to start the conversation now. Thanks to DDOT’s Connie Wheeler and Adolfo Nino for attending the meeting and providing great suggestions. And a big thanks to all residents who were able to attend and/or contacted me with comments. I’ll keep you updated! As I’ve said before, the concepts presented in the final report are a vast improvement over the District Department of Transportation’s initial concepts for the Barney Circle-Southeast Boulevard project. The goal should be to connect the neighborhood to the waterfront and OP’s concepts accomplish this goal in slightly different ways. DDOT is currently reviewing the OP concepts to determine their feasibility. Once this feasibility study is complete, the Barney Circle-Southeast Boulevard transportation study will resume. Representatives from both OP and DDOT will provide an update on the Barney Circle-Southeast Boulevard project during ANC 6B’s July 8 Transportation Committee meeting, 7 pm at the Hill Center (921 Pennsylvania Ave SE). The commission unanimously passed a resolution honoring the life of Charnice Milton, a local reporter with Capital Community News and the Hill Rag who was tragically gunned down on her way home from the May Eastern Market Community Advisory Committee meeting. A tremendous loss for the community. ANC 6B unanimously approved sending a letter (pdf) to the District Department of Transportation sharing concerns about media comments made by a DDOT representative on the purpose of the Southeast Boulevard project. In the letter, the commission also reiterates ANC 6B’s expectation that DDOT remains committed to seeing the full vision of the Barney Circle-Southeast Boulevard project come to fruition. The commission voted unanimously to send a letter to Events DC outlining concerns about the transportation plan and parking enforcement related to the July 4 Foo Fighters concert at RFK Stadium. These questions were addressed during a June 15 Events DC community outreach meeting. The commission heard a presentation from Chris Geldart, interim director of the DC Office of Unified Communications on 911 call center operations. Geldart talked about how the call center works and addressed concerns raised by commissioners and residents regarding specific incidents in the neighborhood. Geldart noted that residents should stay on the line if they are put on hold when calling 911 and that callers are put on hold only if the center notes that their call is coming from an area with high call volume (likely due to the same incident). Hold times are very short. The commission also received an update on the progress of the Hine School redevelopment project across from Eastern Market. ANC 6B’s July meeting will be on Tues., July 14, 7 pm at the Hill Center. On Thursday, June 25, ANC 6B’s Hill East Task Force will meet from 6:30-8pm at St. Coletta of Greater Washington (1901 Independence Ave SE). Ward 6 Councilmember Charles Allen will be in attendance to share his views on the issues affecting Hill East and to take questions. The task force will also hear about the city’s plans to close the temporary emergency family shelter at DC General from Deputy Mayor for Health & Human Services Brenda Donald and Laura Zeilinger, Director of the DC Department of Human Services. If you have an hour to spare this Saturday, spend it volunteering at the Watkins Elementary Garden Work Day. Volunteers will be mulching, building trellises, raking, digging, etc. from 10 am – 1 pm. The award-winning gardens are a great learning resource for Watkins students and help beautify the school grounds. All are welcome! Again, the Watkins Garden Work Day is this Sat., June 13, 10 am – 1 pm at the school (12th & E Streets SE). If you have any questions, contact Barbara Percival (bobperciva@yahoo.com).